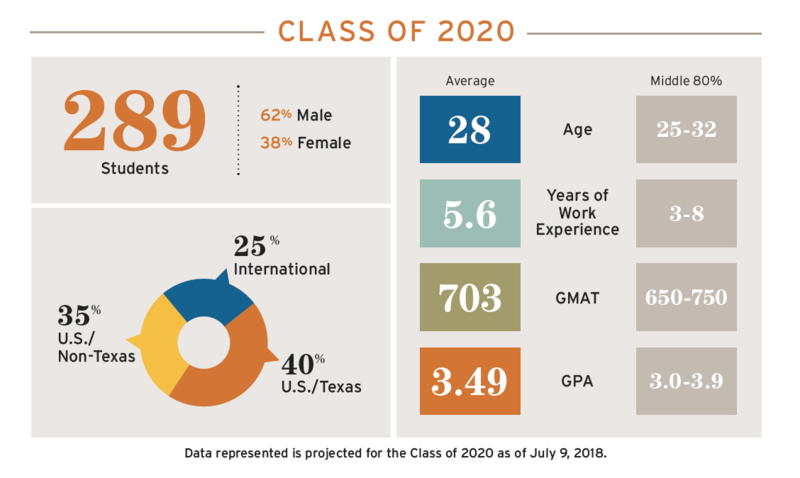 UT Austin’s McCombs School of Business just released a first look at the profile of its Full-Time MBA Class of 2020. The experience the incoming Class of 2020 will bring to campus is equally diverse. The top four pre-MBA industries include consulting (15 percent), finance/banking (14 percent), technology (13 percent), and energy (13 percent). Other industries represented in the class are government, consumer products, media/entertainment, healthcare, real estate, manufacturing, non-profit, retail, travel, and venture capital, among others. Part of what helped the McCombs admissions team assemble such an accomplished incoming class is the school’s increasingly strong performance in closely watched MBA rankings. The school’s MBA program was ranked #17 by U.S. News and first place in terms in the category of “Best Value.” This later accolade was influenced in great part by the strong return on investment McCombs graduates report and the support of a dedicated career management team. Some 92 percent of the Class of 2017 received job offers with an average starting salary of $116,403, along with a signing bonus of $28,280. If you’re interested in joining McCombs’ next full-time MBA Class of 2021, applications open soon. You can prepare by taking a look at the school’s new application essay topics, attending an upcoming MBA event, or reading McCombs’ GMAT/GRE blog series.